After the government was installed suddenly the coastal belt was devasted by a horrifying cyclone. Urir Char area was in particular. Telephone and the entire communication infra structure had completely broken down. There was no communication between Dhaka and rest of the world. Bangladesh government had no means to conduct any relief operation. Uncounted people lost their lives, Men and women young or old and children in thousands got stranded in water. It had become impossible for the newly formed government to face such a natural disaster. If the effected people can be salvaged from the peril then fall of the government is inhabitable. Khaleda’s government was tottering! The whole nation was terrified! Unexpectedly, Kamal appeared to our house himself and informed the Prime Minister asked him to take me along for some urgent business. As the telephone is not working he had to come himself in this way. In her office at Shugandha. She is anxiously waiting there for me. Why has been summoned so urgently, what is the matter? That you would hear from her, now let’s go. That is okay, I shall hear that from her but at Shugandha people of various kind keeps on hovering like humming bees all the time so I am feeling a bit uneasy to meet her there. Why you should feel uneasy that I am failing to understand! You will never understand so, let’s go. We reached Shugandha. When Queen Elizabeth came to visit East Pakistan this beautiful building was specially constructed to be used as her residence. Whole of Shugandha was densly crowded. Kamal’s car moved through the crowd and stopped at the portico. We disembarked from the car quickly and got inside Shugandha. Kamal entered into a room. On the way many greeted with Salam. Sahbbiuddin was waiting there. She is waiting let’s go. Sahbbi showed the way to a room where Khaleda Zia was. As we entered she got up from her sofa to exchange Salam then asked me to sit on the sofa next to her. Kamal and sahbbi occupied two Victorian chairs kept close to her sofa. The atmosphere was somber. Fortunately, you did not go out of Dhaka though you are on leave. If you had then it would have not been possible to contact you. With this introductory remark the Prime Minister stared speaking on the main issue. The horrifying cyclone had created such a problem that the government does not have the means to tackle that. Entire communication infrastructure has broken down. Under this circumstances if the government fails to execute relief and rehabilitation operations for the affected people then the very existence of the government will become untanable. The kind of helicopters our Airforce and Army have can’t reach the affected areas. In such a precarious situation as advised by Kamal and Sahbbi I have called you. Bhai, I am earnestly requesting you, please try your utmost to find a way out. Being the Prime Minister of the country you are not finding a way out. In view of that i am failing to understand how could a simple man like me find a way out! I have come to know that you have many powerful friends abroad. Is itn’t possible to find a way out using their good offices? Please Bhai, try not only for the government but for the interest of the helpless affected people. But Bhabi, the entire communication system has broken down in such a situation how could it be possible to contact abroad from here? Go to any place of your choice from where you can establish secured communication. You may consider to move out today if possible with out westing any time. Kamal please arrange everything that is required for his journey. As you have requested I shall try utmost whatever possible to the best of my capacity not being sure what would be the result. But you have to promise that no other person other than we four would ever know that you had entrusted me with such a difficult and sensitive mission whatever might be the out come. Thanks. We shall beg leave now. If possible I shall try to move out today. Three of us took leave from her and returned to Kamal’s office. Kamal Bhai, One of my friend runs a travel agency. If we send some one to him arrangement could be made for Dalim Bhai to reach Bangkok to day. From there he would be able to go anywhere he likes. Go yourself and come back as soon as possible. Should I return with the confirmed ticket? After Sahbbi had left, it was two of us in the room. Kamal through intercom ordered some one that no one should be allowed to enter his office till he is with the guest. My dear friend, since the anti Ershad movement till the elections the role you had played behind the scene that is not known to any one other than Madam. But I came to know some of it. Did Piter Custer whispered into your ears? Both of us laughed aloud. 10000 Dollars in cash. If that falls short then I shall use the credit cards. On return I shall give you details of every penny that would be spent. That’s not important really. To be honest, you all particularly you have surprised me! The kind of betrayal and ruthless injustice Zia had done with the spirit of 15th August revolution and you all even after that, at every critical juncture of the nation behind the scene you all have been making selfless positive contributions to the best of your capacity with out any expectation in return, would this unfortunate nation ever evaluate correctly such selfless sacrifices! You have said it wrong. We do have one expectation in return. That is to carry forward the vow that we had taken to materialise the spirit and the dream of liberation war. In that struggle we would not hesitate even to sacrifice our lives till we breath the last. After the successful historic revolutionary uprisings of 15th August and 7th November Gen. Zia was placed at the center of power by the leadership of Sena Parisad as planed. Later, the way the same Gen. Zia had stage managed conspiracies martyring more than 3000 tested and dedicated members of Sena Parisad with inhuman brutality, the plea was to bring back stability within the armed forces! Is it not a good enough proof of my statement? The injustice that Zia had done with the Sena Parisad just to perpetuate power he could not evade the punishment for that though, the punishment at the final day of judgement still remains pending. I would like to tell you one more thing, we firmly believe politics based on treachery(Munafikiat), vindictiveness and false hood can not last long. The blatent lies might creat a gimmick but that fades away within a short period of time. On the contrary truth prevails for ever. Dalim, you always say not to look back but to be forward looking. In this context during his visit to PRC Zia in presence of Chacha(My Father) embracing you had said, ‘Let us forget and forgive and start afresh’. Why did you reject his proposal? Take it easy, nothing to feel small. Truth is stranger than fiction. Besides, everyone has his own limitations that is also known to us. You are politically conscious, intelligent, highly educated brilliant bureaucrat. That is why you are in the good book of various quarters within and outside. We don’t have credentials like you. That is why we got to survive now and in furure solely depending on our own limited intellect and acumen. Actually, Zia was highly ambitious but over estimated himself at times. His offer was a very foolish bait to allure us within his fold and crush at his will. Because, he had been under continuous fear and threat that it is only we and no one else who could unmask his dirty face and duality to the people if need be. Therefore, how could we offer ourselves to be entrapped? Hope, I have made myself clear. You are smart enough to fathom the rest. Actually, Zia was highly ambitious but over estimated himself at times. His offer was a very foolish bait to allure us within his fold and crush at his will. Because, he had been under continuous threat and fear that it is only we and no one else who could unmask his dirty face and duality to the people if need be. Therefore, how could we offer ourselves to be entrapped? Hope, I have made myself clear. You are smart enough to fathom the rest. Then why are to helping Khaleda? As you have succeeded to become the Principal Secretary then you come to know much about the game behind the scene in due course of time. But, I must say it’s a very smart move. This has removed many misgivings all around. At the same time this would also give you the opportunity to be one of Khaleda’s most close trusted confidant. With time you would also become a sought for blue eyed boy in the capitals of may powerful countries particularly in the West due to your credentials, character traits and brilliant track record. On the other end at present we all have become undesirable. Don’t have any acceptance worth mentioning any where. We are also aversive everywhere. Kamal was listning every word of mine very attentively. I must confess, there can not be any coparison with you all and me and many others like me. But, I must say it’s a very smart move. This has removed many misgivings all around. At the same time this would also give you the opportunity to be one of Khaleda’s most close trusted confidant. With time you would also become a sought for blue eyed boy in the capitals of may powerful countries particularly in the West due to your credentials, character traits and brilliant track record. There is ten thousand Dollars. All arrangements have been done for me to reach Bangkok to night taking a Thai flight. You better go home now, One of my officer would collect you from the house in time and see you off at the airport. Let me take you up to the car. I have to travel for a few says outside the country that has been decided in the meeting at the Prime Minister’s office. Arrangements have been made to fly off to night. In my suite carrier and hand bag put everything that are necessary. In time Kamal’s protocall officer would be coming in time to collect me and to see me off at the airport. Initially at Bangkok. There is not much time so, quickly arrange something to eat as I have to get ready. Sir, One of my senior couleague has sent me to convey that he desires to come personally to pay his Salam to you. Tell me, whats up? It is known that interested people visit the zoo to see stange animels, have I fallen to that category? Bhaiya, If your presense was known to the public at the airport, they would have stormed the place to have a glimps of Major Dalim. At every circle the people are so much inquisitive about you that we become overwhelmingly surprised at times! To the people you are like a mysterious hero of the fairy tale! Is it so? Very thought provoking indeed! Special instruction has come from the PM’s Secretariate that your presence should be kept secret, in that context with out taking into cognigence how would you be taking my request imotionally had put up my request to meet you, hope you have not mind Sir? Not the least, there is nothing to mind please take your seat. He sat next to me in the sofa. Would you care for a cup of tea? Saying so I signaled the attendant to serve tea to the gentleman. Do remember us in your prayers. Dua of people like you would streanthen our resolve and confidence to work for the greater interests of the country and the people. Sir, I must be going now, thanks a lot for giving me the audiance. I myself is feeling honored receiving a pious Bujurg like you and your Dua. Both had left conveying Salam. Bhaiya did you see? Tears don’t roll down the cheeks out of immotion of any one visiting the zoo while watching the animals I suppose! Whatever I said before the ealderly pious gentleman had just proved that. I was conveying to Allah Subhan Wa Tala my heart felt gratitude(Shukriya) on the quite with out replying Mahua. Even after so much adverse propaganda and persecution the countrymen still have love and Dua for us! They also have many expectations! Sir, let’s go, Bhabi and Apa you also please come along. As we all entered the aircraft a charming airhostess came smiling and escorted me to my seat. According to the norms when any VIP is travelling the cockpit and cabin crews are informed by the airport authority in advance for special handling. Where ever you stay do call when tele communication is restored. Said Nimmi. Thanks a lot, you have been very kind and had taken lot of troubles. No, thanks just a glass of plain water please. Time passed while reading the book. Reached Bangkok. From the airport I got a room booked at the hotel Dusithani and reached the hotel with a hotel limousine. This was then the most modern, prestigious and expensive hotel in Bangkok. After checking in got into the room. It was past mid night. I usually sleep after Fajar. From my early days I became a night bird. After taking shower I got into the bed and fell asleep. I woke up at around 11 AM. This is the time Ganga Bhai could be easily contacted. He is an early riser. He is not used to late night. So, after freshening myself and having breakfast I called him. No, thanks just a glass of plain water please. Hallo, Ganga Bhai was on the otherside. from where you are calling? I am calling from Bangkok. Reached last night. After watching the news of the devastating cyclone in the TV, I called Nairobi and learned that you are still at Dhaka with the family. I tried to contact you at Dhaka but it was not possible as the tele communication system had broken down totally!I became anxcious to contact you being worried seeing the awe some damage it had caused including loss of lives. That’s understandable. But brother, whatever you had seen or heard the actual damage in term of loss of life and property is thousand times more than that. Bangladesh is completely devastated and got totally isolated from the rest of the world. Uncounted people have died. In thousands men, women and children are stranded in water helplessly in the affected areas. They are counting every moment to breath their last with out drinking water, food and shelter under open sky. Epedemic of various deseases is spreding and engulfing the destitudes. Bangladesh government does not have the capacity to face this catastrophic challenge. Communication infrastructure had collapsed therefore, it has become impossible to reach the affected areas. You are well aware of the fact that after the unexpected defeat in the last elections Hasina became outragious and demanded there was suttle rigging in the election and for that the government of Khaleda Zia would not be given any respite for a moment. If the cyclone affected water stranded people are not salvaged then fall of the government is imminent. With that all our past efforts would go down the drain. The country and the people will once again be strangulated by the Indo-Soviet axis. Earnest request has been made by the Foreign Ministry to the Western countries for immediate help and assistance through the Ambassies and High Comissions but no response yet. The American Ambassador replied to the Foreign Minister that the request would be forwarded to the State Department on urgent basis. That’s all! Any approach through official would be efective to get any immediate responce to tackle the calamities of the cyclone affected victims. We are aware, Dalim Bhai has been able to cultivate personal friendship with many invisible powerfull individuals in the corridors of power and civil societies of many countries over his long 20 years carrier as a diplomat. He is still in the country so, you might as well call him and request whether he can do anything taking personal initiative. He might exceed to your request for the greater interests of the country and the nation. We shall also try to convince him. At their advice the Prime Minister summoned me at her office and requested me to try to do anything that is possible to find a way out. To be honest, they had all most forced me to travel to Bangkok with such a difficult mission. Could it be possible for you and other friends at the Capitol Hill to do something to save the government urgently on priority basis by passing the bureaucratic hurddles? Please explain to me, exactly what kind of help and asisstance you are asking for salvation, releif and rehabilitation? Ganga Bhai, nothing can be done at the present situation land based as it is not possible to reach the affected areas by road. Only through a ‘Sea Borne Operation’ salvation, releif and rehabilitation works can be executed successfully in the affected belt. A mighty naval fleet like that of 7th Fleet can undertake such an operation. As I know, now the 7th Fleet is cruising towards Spacific. If possible to divert the 7th Fleet to Chittagong then salvation, releif and rehabilitation work at the affected coastal belt along with Urir Char which is the most affected area can simultaniously be under taken. There is no other alternative. If the friends can save Khaleda’s government this time then it would not be only Khaleda Zia who will be greatfull but at the same time the misperception that had been created in the mind of the people of Bangladesh about the decision of the US government to divert the 7th Fleet in the Bay of Bengal just before the fall of Dhaka of which Indo-Soviet axis is taking political advantage till this date would not only be washed away but the immage of USA would be totally changed and enhanced trimendously. But Ganga Bhai, time should be considered as the most important factor here. That’s right. I have understood everything very clearly now. Right away I would be on my way to Jim at the Capitol Hill. After explaining everything to him I shall take him along to discuss the matter to the rest of the friends. On this issue only one person has the capacity to get the consent of the President directly, our dear friend Jessy. You have rightly said so. In the interest of all of us you must extricate the consent through Jessy by any means. There will be no darth of sincere efforts. But comming 2-3 days you have to be close by the telephone. By that time the decision would be made I suppose. Our responsibility is to try our best but result will depend on Rab’s will. Please do keep me posted the developments from time to time as I would be anxiously waiting for that. Of course. A piece of advice, you yourself also call Jim just now and inform him everything about the situation and explain what needs to be done. At the same time you would also tell him that you have requested me to get in touch with him and I would be reaching shortly at his place. Okay. I am going to get in touch with Jim right now. I phoned Jim and explained everything to him. I emphasised to him not only for bi-lateral relations but to save lives of thousands this plan has to be exucated by any means. As a humanist and staunchly against unjust oppression of the people Jim is well known at the Capitol Hill. He has served more than 40 years as the uncontested congressman representing people of his conostituency due to his unique character traits. To him religion, class, creed, color do not mean anything. He measures everyone with the same balance. Humanitarian Jim is a symbol of justice and and truth for that a well respected person within the corridor of power. He has earned this respect during his long active life for his honesty, efficiency and as a selfless dedicated soul and worker for the interests of the people. A process to turn an impossibility into a possibility has started. I have to sit beside the phone for 2-3 days. During that time the book on Mendela would be my company. Jim called me during lanch break. We have got to gather on priority basis. Brother Ganga is also with us. All facts and informations are being collected from relivent sources. After thredbare analysis of all those Jessy has agreed to take the prepared presentation to the highest decision maker. Reasonably, it is expected his initiative would not be in vain. The decision would be made by today or tomorrow. I shall be waiting to receive the positive decision. Hearty congratulation my friend, the President has agreed to your propossal. From the relevent authorities the Pecific Command has been instructed to divert the 7th Fleet to the shore of Chittagong to help and assist Bangladesh government in every possible way in launching the operation forthwith to salvage the water stranded people and to carry on releif and rehabilitation work. United States of America would also play the leading role to arrange all releif and rehabilitation materials that would be required. The operation has been named ‘Operation Sea Angles’. The name has been decided by all of us. How is it? Excellent! Thanks to all of you for this humanitarian compationate gesture particularly to the honorable President. The people of Bangladesh would ever remain grateful for this overture from the United States of America. You may go back and give this news to the Prime Minister. The same would be communicated later formally to the PM by the US Ambassador at Dhaka according to the normal practice. I shall be visiting USA as the special envoy of the Prime Minister as soon as possible to thank you all for your such contribution. During the visit besides the bi-lateral relation I would like to discuss with the friends on few other matters. Personal relationship can do miracle at times that is the lesson I have learnt during this trip. I am returning by next available flight. From the reception I came to know that tele communication with the outside world has been restored. Next day morning after confirming the seat in the Thai flight I called Kamal informing my flight details. I also requested him to convey to nimmi about my return. Of course. My man would be there at the airport to receive you. From the airport come straight to Moinul road residence to meet the Prime Minister. I would also be there. What is the out come of the trip? Why are you getting so impatient? You would be hearing everything in front of the Prime Minister. But just can tell you this much that your Madam got survived this time! You would remain a mysterious person all through your life. Do you remember on our way back after finishing my term as the Economic Counsellor Minister at the Bangladesh Embassy in Beijing it was you who had arranged our family tour of China through your friends. Even a VIP I suppose, does not get the privilege to have such a grad and luxurious tour! The memories of that visit are unforgettable. During the visit the way the friends were praising you from that I thought you must be having a magic wand with that you can easily succeed to hypnotize others! In this respect you are far nore ahead of me. To hypnotize others your skill is more effective. If that is not the case then why Khaleda Zia had chosen you as her Principal Secretary out of so many bureaucrats loitering around even knowing that after the 7th November uprising her husband Gen. Zia had thrown you in the Jail for some time my friend? Dalim had reached. Within a hour or two after finishing the meeting with the Prime Minister he would be home. Meanwhile, I am sending three crates of fruits he has brought from Bangkok. But what would happen with my share Boin(Sister)? Tell me how are you keeping? How was the trip? Two days had passed in tension but returned with good news. At the order of the President of the United States of America, the 7th Fleet has been diverted to the shore of Chittagong to help and assist your government in salvation, relief and rehabilitation work at Urir Char and other affected areas launching a sea borne operation. America would also take the initiative to arrabge all required releif materials. Within next 48 hour the 7th Fleet would be reaching the shore of Chittagong. Soon after reaching the ‘Operation Sea Angels’ would be launched. At the appropriate time the American Ambassador through the Foreign Ministry would be conveying the same decision to you formally on person. Both Khaleda Zia and Kamal Siddiqi were totally flabbergasted and dumbfounded. As both of them were finding it hard to beleave what I had coveyed to them. I am slightly tired so, if you permit then I shall like to beg leave. But Bhabi, I would like to request you before leaving please remain quite about the decision till the Ambassador comes and convey the same formally to you. Just to remind, you had also promised before my departure who had done what, how it had been done that also be kept as a seceret by you. Saying so I stood up. I was really very tired. Yes of course. From your look it is clear that you need some rest. I shall call you again after I meet the Ambassador to discuss some important matters. Sure, you can call me anytime you like but it would be more convenient for me if you call me here rather than Shugandha. Shall do so. I shall once again not belittle you saying thanks for all that you have done. Khaleda Zia along with Kamal came up to the porch to say good bye. Kamal’s car had returned by then droping the fruit crates and my baggage at home. My dear sister you don’t know he has returned after accomplishing what an unbeleavable task in last two days. One day the countrymen would surely give due recognition to this contribution that he has made. Poor fellow is very tired. He remained in tension for last two days and two nights. I know all would be coming to meet him. But you must force him to sleep for some time if need be giving him tranquilizer. After advising Nimmi Kamal took leave and left for the office. Get freshed before everybody comes. Thats right Bhaiya, you better have a good nap otherwise our gathering at night would not be enjoyable. We would go to Royal Orchid for dinner to night Mahua said. Okay then, let me be off. I entered the bed room and dashed to the bed. Nimmi followed. She drew the curtains and lied beside me. She is habituated to take an afternoon nap. Within a few minuites I was in deep sleep. So much so I just could not feel when Nimmi had left the room after having her nap. I woke up with the Azan of Magrib. As I entered the sitting room after saying my prayer Manu, Safu, Keya quickly got busy in serving the evening tea. Mostafiz Kakku by then had returned from the office and was making every one hilarious cracking jockes in a jovial mood in his amusing style. It seems that you had an unusually long nap. Is it the impect of your trip to Bangkok? As it is not customary there to sleep at night. Thats quite true Kakku. But this time, every moment was hell due to pressure of work. could not enjoy anything due to tension. I had to sit beside the phone all the time. If one is forced to be confined in the hotel then is it possible to enjoy Bangkok at night! Around 8 PM Kamal phoned and informed that this afternoon the American Ambassador called on Khaleda Zia and conveyed the same formaly that I had said. Khaleda Zia appreciated the guesture of the American government and expressed her gratitude. She had also welcomed the arrival of the 7th Fleet. Good news. You have sold me perfectly well. Now listen, Mahua is taking us to Royal Orchid. Mohua is inviting you with your family. So, come along. Tell my sweet sister I am delighted that she remembered me but after a while an urgent cabinet meeting will start. Understood. Okay then, remain seated under her petticoat you bloody carrierist. We are going, Allah Hafez. After droping the phone as I entered the sitting room the TV announced about a special bulletin. In the special bulletin it was shown to the countrymen that the American Ambassador was holding a meeting with the Prime Minister and conveying the decision of the American government to send 7th Fleet to help and assist Bangladesh Government to carry out evacuation, relief and rehabilitation operation in the affected areas. Watching that bulletin everybody was happy and commented that this is a big diplomatic victory for the Khaleda Zia’s government. This would put back the tottering government on firm footings again. If the ‘Operation Sea Angle’ was not arranged then Hasina would have pulled down the government easily. All were profusely appreciating the success of the Khaleda’s government. I was enjoying the reactions silently. Mahua came and informed all were waiting at the hotel so, all of us hurriedly reached Royal Orchid. There Khalamma(Litu’s mother), Shangita, Dipti, Shupti, Mithu, Kappa, Aunti, Kamal Shah were present with the kids. Khalamma, Chacha(Nimmi’s mother and father), Mostafiz Kakku and Minu Fuppu had arrived with us. Nannu, Keya, Milon, Manu, Prince, Safu came with their children shortly followed by Shapan, Rosy, Bappi, Bulu and their children. Receiving Mahua’s phone Litu also came and joined us. It turned into a splendid get to gather of all immediate family members. In a relaxed and happy atmosphere we enjoyed the dinner with favorite Thai cusine and left the hotel after thanking Mahua and Litu. Everyone went away to their homes. We also came back. It turned into a splendid get to gather of all immediate family members. Most of the family members are more or less night birds so, they wake up late. But there is some difference between me and Nimmi’s daily routine. I usually wake up with Fajar’s Azan, say my prayers and go to sleep again and get up around 10-11 AM. Nimmi on the otherhand does not sleep after Fajar. After prayers she recites the Holy Quran and does some wajifa. There after, she wakes up Shosti in time and sends her to the school. Then she gets busy with the household staffs. I do my daily work out, finish my brakefast and go to the office. After Lunch Nimmi takes a siesta along with Shosti for an hour and half. I can’t sleep in the day so when they sleep at that time I go through the important files, read or write in the quite environment of my study. ‘Operation Sea Angle’ has been launched jointly by the members of the Bangladesh Armed Forces and the Marines of the 7th Fleet. Surprised countrymen were watching with unbelievable eyes how the lives of the water stranded people in thousands were being saved by the members of the national armed forces and the Marines like Allah’s sent Firistas with stunningly speed using modern means and technology. Releif and rehabilitation work was also started alongside speedily. Enough relief materials were pouring in from all over the world. Through the Media people also could see the Prime Minister beside the distressed victims. The graph of popularity of Khaleda Zia was almost touching the sky! The ‘Operation Sea Angels’ could also leave a proven glaring example that a nuclear powered huge naval fleet with colossal power to fight a war can also be employed for the humanitarian cause. All the credits, appreciations and political benefits went to the Prime Minister and her government for being able to handle the catastrophic natural calamity successfully immediately after taking power. Thus, efforts of those for which Khaleda Zia and her government could be the sole claimant of all the appreciations and credits of ‘Operation Sea Angles’ that remained unknown not only to the Bangladeshis but to also the people of the outside world. There after our days were passing merrily having lots of fun. Every night informal parties are being thrown at some friend or reletive’s house house to entertain me and Nimmi. All the common friends along with their better halves are attending those parties. Musical sessions were also organized in those parties as both of us are fond of music. We were also asked if we wanted anyone in particular to be invited. One night we were enjoying a lively party at Shapan’s residence. Suddenly Aziz Muhammad Bhai came closer and sat beside me and Nimmi. Dalim, I have a grivance against you two. In any party at my home starting with diplomats, politicians and the big shots, fishes, leaders of the civil society who so ever I invite, they all come and attend my parties with pleasure. But being close friends you never attended any party at my place, why? You are quite right, your absence did not made any difference but I felt hurt personally. Look Aziz, usually your parties are not closed and informal. Ratherone can say that those are gatherings of individuals from different tires of the society having different mind set. We both consider ourselves out of place in that kind of gatherings. We only injoy those parties where the participants would be close and intimate friends whith whom we can talk opening our hearts with out any reservations, we can crack jokes, tease one another and can freely share the good or bad memories of the past to laugh or cry. That kind of atmosphere does not prevail in your parties. This is the main reason of our absence. There is no other reason. I am sure you do understand the difference between today’s party and those of yours. Aziz was sitting absolutely quite in morose. Shahnaz was then singing a hit Gazal of Mehdi Hassan and Bacchu was playing Tabla. Lets go and listen the songs. Saying so, we joined the crowd surrounding her. Lets get to a quiter corner and sit. We understood kamal is suggesting to discuss something with us. We three came out from the dinning room and sat down in a sitting room up staires. I would like to discuss an important matter with both of you. Though I might not be knowing the whole truth but certainly know little more than others basing on which force and how Gen. Zia could sit at the center of power. But soon after he consolidated his power he being one of you identified you all as his strongest opponants and viciously betrayed with the Sena Parisad and its leadership. Zia did not only tried to prove that he was not associated in any way with the revolution of 15th August but also tried to uproot your streanth by killing ruthlessly thousands of revolutionaries and thrown many into Prisons without any trial. At one time he had taken initiative to implicated you and others in a conspiratorial case to give capital punishment. Many of those who were thrown into the Jails are still undergoing inhuman sufferings. I had the opportunity to talk to some of them when I myself was imprisoned. Example of selfless patriotism of their’s and you all is rare in the world history. Thinking about the future of the country and the nation you have accepted everything quietly. All though, I know you had enough streanth to throw out Zia from the seat of power any time you wanted. Considering the possibility of Indian invation you did not do so. Each one of you is a burning example of self sacrificing soul. I am also aware that each one of you including yourself are egger to get rehabilitated freely in the society leaving your job. In view of this, from the time of anti Ershad movement up to the elections and after the elections till this date on behalf of all others whatever astonishing contributions you had been making for the greater interests of the country and the nation behind the scene, Khaleda Zia is the biggest beneficiary of all that. Against this reality, is it not rational to raise the demand to release those who are still languishing inside the Jails at the same time to rehabilitate you all freely in the society with due respect and recognition? Certainly this is rational. You may be right. But you must realize one thing, from the days of liberation war till this date whatever we have done that is for the greater interests of the country and the nation not to serve any one’s self interest. If any individual is benefited in the process due to our selfless contributions that is his or her good luck and we do not consider it rational to seek anything in return for ourselves from any one against whatever contributions that we have made. Before the elections Khaleda Zia herself had promised that if she wins in the elections then she would be redressing all the injustices that had been made to us fro Zia’s time on priority basis. There are many witnesses to her this self proclaimed commitment. If she does so then we shall think that she has realized that the historic sucessful revolutionary uprisings of 15th August and 7th November were two links of the same chain and leadership was provided by the same force that is Sena Parisad imbued with the spirit of ‘71. Recognizing that truth she had considered to rehabilitate us in the main stream of national politics allowing the opportunity to carry forward our mission. If that realy happens then we shall also think seriously how to ingrain the roots of the politics based on nationalism and progressive Islamic values in the social fiber developing what kind of relation with BNP and other like minded parties and groups taking lessons from the past experience. We do not believe in the poitics of the frogs confined within the well. We have a clear long term well thought of vision. To materialize the defined objectives the Sena Parisad has a programe based on ideology. You are aware of all these to a great extent from the time of liberation war. Now listen, if you permit then on these two issues I can try to convince Madam to take expedecious actions. I have nothing to say in this regard. You can do whatever you feel like. Bodda, none of your efforts would be fruitfull. 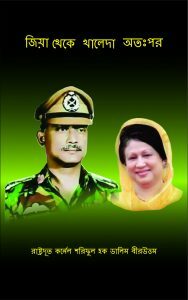 Khaleda will trodd the same path that of Gen. Zia. Rather I feel in time after acheiving her interests whatever possible she would simply forget her promise that she has made. It would not be possible ever for your Madam to allow Dalim and his other comrades to stand on firm footings in politics separately. There are many reasons for that. Sooner orlater she would also establish another unprecedented example of betrayal. Lets go down. Boin, there is no harm trying. Nimmi did not relpy. We rejoined the crowd downstairs. Why do you carry such a negative impression about Khaleda Zia Boin? It seems you are hurt! In that case let me explain. You might be knowing quite a bit of this. Gen Zia implicated Nabi Bhai along with Dalim and others in the conspiracy case and after his arrest ordered to start a court martial proceedings against him. Col. Nurunnabi khan BB was then the commanding the EME Battalion at Dhaka. Not only that, from the very beginning till the end Nabi bhai had fought the war alongwith Gen. Zia. Any way, with this order of the court martial the sky befell on the head of his wife Jhunu. Jhunu was forced to move out from their official residence. Jhunu with small kids became destitude after being evicted from the residence. Though, Jhunu was a M.A. she could not get any job as most had avoided this lady wife of a well known decorated freedom fighter not to fall pray under the wreath of Gen. Zia. Jhunu somehow managed at that time take a two room house in a lane close by the slum of Elephant Rd. By the grace of Allah, the all mighty she finally also got a job as a teacher in an ordinary school. Jhunu was then completely devastated struggling to meet both ends of each day. None of the known ones bothered to extended any helping hands in those crucial days. At times you all become hysteric talking about the country and the people, also do not hesitate to take extreme risk with out considering the consequencres. But for that we have to face the music. This has never been a matter of any consideration to you all. We also accept everything lying with pride looking at your sincereity of purpose. I used to send an insignificant amount monthly from my salary that I used to earn as a sale’s girl in East London. Stop all these drama and crying! Do you know how many people my husband had hanged or sent to the firing squad? Thank your stars that he is still alive! Whatever will happen to him that would be as per the law. Thus she was asked to leave. What was Khaleda then? Just an ordinary house wife. A lady who could be so vindictive and heartless, having no compassion, void of any fellow feeling, does not possess minimum curtesy to show any sympathy or afftection for the distressed lady wife of a valiant co-freedom fighter how should she be judged, as a human being or a beast? Being humiliated like this Jhunu came and thrown herself in my arms and totally broke down. That day I myself felt guilty while consoling Jhunu. Gen. Zia’s agencies failed to get any confessional statement from Nabi Bhai though had been brutally tortured. There after, the court found him not guilty and he was released. But Jhunu did not live longer and died fighting with enormous odds and adversities. After listning what Nimmi said Kamal became dum founded and bowed down his head in shame. Jhunu suddenly appeared in my mind. She had always welcomed us with her simple smiling face whenever we visited their home. We did not like to stay on enjoying the party any more and returned home speechless with a sadden heart as I never knew anything of this before. Shapan said to me that he himself had gone to Nabi to invite. But as Nabi had to leave for his sight that night so he apologized and told Shapan that he himself would be meeting me and Nimmi on return. My dear friend, Since I got out of the Jail, I had taken a vow that I shall never stepped inside the cantonment crossing the gate till my last breath. So, please be kind enough to come to my office along with Bhabi. From the office I shall take you home. Nabi’s office at the Elephant Rd was big. He was then heading a flourishing business. After coming out from the Jail he established a construction farm. Now, he is not only a successful businessman but has been able to establish himself at the top echlon of the monied people in the country due to his merit and share hard work. He got us seated in front of his huge glass top table inside his chamber and sat on his revolving chair on the opposite side of the table. Even after unexceptional meteoric success I found no change in Nabi. He was the same good old Nabi! Why have I wanted you come to the office you know? To show you this, Nabi pointed to a hundred Taka note kept under the glass top in front of him. Nabi Bhai this is a hundred Taka note! Didn’t I tell you, if you start the business with the gift of a devine angle like Bhabi Allah Pak will bestow His unfathomable Rahmat on you. While Nabi was saying all this his chicks were flooded with water trickling from his eyes. Our eyes were also getting moist because, Jhunu could not enjoy Nabi’s success for long. Jhunu all of a sudden unexpectedly embarked on her eternal journey leaving every one behind! Lets go home, the children are anxiously waiting for you all. At the 2nd capital Nabi has made a huge 4 storied house. Three floors for the three children and the ground floor for himself. Hearing the sound of the incoming cars his only son and two daughters came running and embressed Nimmi after conveying Salam. Nimmi handed over to them some gifts and chocolets that she had brought. There was no darth of anything in that huge building except the welcoming of Jhunu with her ever innocent smiling face. The children took Nimmi up stairs. Me and Nabi stayed down staires. Beleave me Nabi, I knew nothing of this at all! That is expected. Whatever Bhabi had done she did it as her duty silently not informing any one anything. This is why she is excepsional! Little later the ealdest daughter came amd took us to the dinning room. Most of the items were my favorites. Small fishes of various kind, vegitebles and daal. I was surprised as the dishes were prepared exactly like Jhunu used to prepare! Maa, who has cooked all these? I asked. The ealdest daughter replied I had cooked all the items myself. Perhaps, my cooking is not that good as Ammu’s? On the contrary, test of every dish has been just like Junu’s. Your cooking is just like your mother’s, Ma Sha Allah! Tomorrow is Thursday, I shall take you all and Minu fuppu to Narshingdee to meet my spiritual Guru, he is an accomplished Sufi saint. Strange! Since when you have got inclined to this field. I have all ready performed my Farj Hajj too. What are you saying! The protege of Karl Marx of Swindon has performed the Hajj! This is just an unbelievable change! That’s what happens my friend. Human being changes in no time if Allah desires. After Jhunu passed away I have also changed. But don’t think I am a typical fanatic Mullah. If you talk to Baba you would like that. The unpoluted environment of the village would also be enjoyable. Tomorrow at 11 AM you all will come up to the main gate of the cantonment, I shall be waiting there. Good enough! If we get the oppurtunity to spend a day in the company of a Bujurg away from the city then the poluted soul would get cleansed to some extent. After returning home as I informed Minu Fuppu about Nabi’s invitation she eggerly accepted. Benu Fuppu, Manu and Keya were also present and expressed her desire to accompany us. Mustafiz Kakku’s father was also a renound Sufi Saint. So, was my maternal great grand father. These saintly persons through their deep meditation attempts to fullfil their unquenching thirst to get closer to Allah and at the same time remains absorved in their own ways in search of the spiritual knowledge how Allah maintains His reign over heaven and earth, the universe and the world here after. All these large hearted ladies are very religious. Their love for the people is devine and spontenuous. The way they offer themselves selflessly at times out of their way to help and sympathize with the distressed is exemplary. It is hard to find such charecters in today’s world with such magnanimity. Similarly, Mustafiz Kakku is a lion hearted person. Chairman of BJMC and BJIC Mustafizur Rahman all through had been well respected by his colleagues and Jute traders through out Banglasdesh for his foresight, honesty, exceptional knowledge about Jute and his vast experience as an able administrator. A person hailing from a noble family looked tough outwardly but his innerself was as tender like a child. As an ideal couple they had been a shinning example. Both of them had loved me and Nimmi more than their own children till their last. They always shielded me against all the riskd and hazards I had been undergoing without any fear or remorse. In return, I could do nothing for them. The love and affection of father and mother can’t be reciprocated either. Love and affection is an one way traffic that always trickles down from the top to bottom. This is also a natural phenomenon.